Topflight Stamps Birthday Blog Hop! 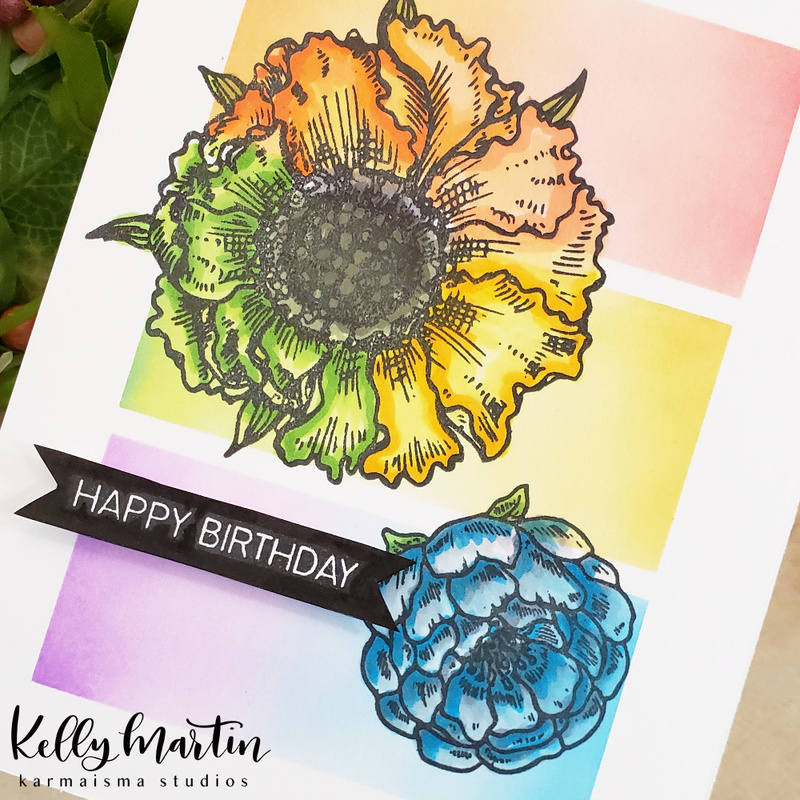 For today's card, I'm using the Wild Poppy stamp set by IndigoBlu and the Darkroon Door Boxes 3 Up Stencil. 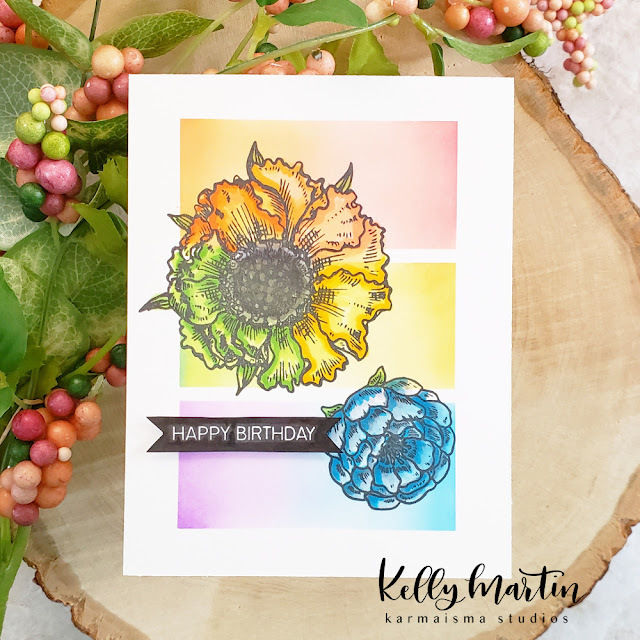 I used a rainbow assortment of Distress Oxide ink colors and a blending tool, and created the rainbow card panel. I then stamped the images from the stamp set on top of the rainbow panel and then colored the areas that overlapped with the oxide inks with the coordinating copic marker colors. This technique really made the floral images pop off the page! I finished off the card by stamping a sentiment banner from the Brutus Monroe Botanical Banner stamp set, cut it out and then mounted it on the panel with foam tape. I glued the panel on to a cut and scored 4.25 x 5.5 inch card base and called it good! Now, of course, it wouldn’t be a birthday celebration without prizes! 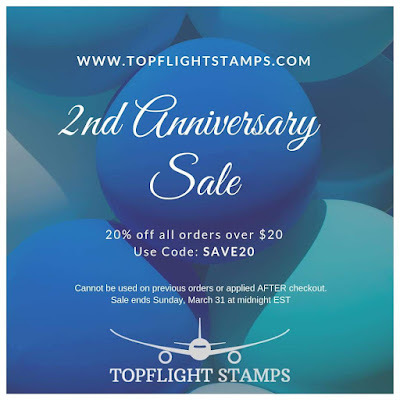 Topflight Stamps is giving one lucky winner a $50 Gift Certificate, and each stop on the hop has an additional $15 Gift Certificate up for grabs. To be in with a chance to win, make sure to visit every stop on the hop and leave a comment by April 8th. Winners will be announced on the Topflight Stamps blog on April 9th. Good Luck! And if that wasn't enough already, there's also a special discount code for my blog readers! From now until Sunday, March 31, enjoy 20% off your order of $20 or more with code SAVE20. Shop here to take advantage of that awesome discount. Thanks so much for stopping by and spending some time with me! Happy hopping! I really like your color choices Kelly. The way the flowers use the colors from the rainbow panels is beautiful. Really lovely card. Classy card that could be used for so many occasions by just changing the sentiment. And I know what DOK is, so I know you are a giving, loving person. I haven't tried Copic coloring over Oxide inks! Thanks for the idea. Wonderful blending on this card.I really like that the whole design blends smoothly from back to design. Keeps your eyes moving. Thanks for sharing and have a great week. your cards is amazing.. love the color blocking. Thanks for joining us at TFS. Thanks for having me, Annette! :) I enjoyed it! Lovely card. I hadn’t thought of using Copics over distress Ink’s. Going to give this a try! Very nice. Love your ideas. Your card layout is great! I love the pretty colors you used. Lovely color blocking card! TFS. How pretty! Love the soft colors! That is beautiful card. I love those big blooms! What a neat concept. Really like the colors you chose. Very pretty. I liked the masked background a lot. Great ideas. That is a beautiful card. Now the hard part is to remember this technique and use it myself. Great idea! Love the way it turned out! So many fun colors! Great unique design! Yeah! !I'm a fan of snail mail too. I still mail cards and belong to a group called "Caring Cards"
Fun to see your unique card. Thanks. Beautiful way of working those colors together! Such a lovely design! Beautiful colors and design! What a great design! I love the colors you used. Love the color choices and the layout design. Black Llama, I love this card so much! Fabulous blending and idea! A very nice card. So elegant. I love the three distinct areas of different blends - so cool! This is a very clever idea and one I'm going to try! Thank you very beautiful! Pretty design and I like the rainbow of colors. Love your card and your technique of adding copics over the oxide ink. Fantastic! Beautiful card! Love the colorful flowers. Love, love, LOVE those boxes - such a brilliant idea. Very pretty card chickie!!! Fun to hop together again. :) :) MWAH!!! Pretty poppy flowers! Love the background you created too! Pretty card! Gorgeous card! Always love rainbow colors. I love how you blended all the Spring colors! So pretty! Wow, I really love the look of your card, those color blocks are amazing! This is very pretty! Kind of reminds me a bit of Andy Warhol :) Sure is a cool technique - thank you! Great card and I love the colors. So pretty! I love this technique, so creative and pretty. A great sample using oxide inks. Gotta try this one. So beautiful. I love the look of coloring over colored paper/inking. And that stencil seems so simple, but I can see so many ways I could use that. Thanks for sharing with us! Great color blending! Really pretty card! Brutus Monroe Blog Hop--Anything Goes!